Start: Car park on the B1342 at Waren Mill(NT415634). 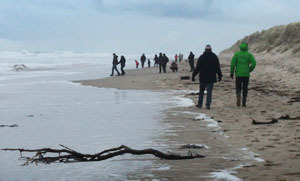 The route follows roads, field paths, the beach and sand dunes. 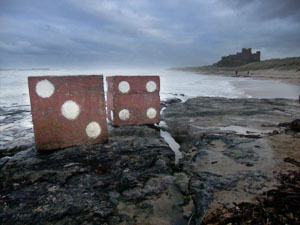 It leads below the impressive structure of Bamburgh Castle and provides views of Lindisfarne and the Farne Islands. Refreshments: A variety of pubs and tea rooms in Bamburgh. We enjoyed afternoon tea at the Copper Kettle. From the long lay-by of the car park, walk north east and up to the crossroads at Budle. Follow the footpath sign just beyond the crossroads. There is no clear path across the field, but head in the direction indicted by the sign towards a stile and gates. From the stile, follow the stone wall on right which leads to an access road to caravan site and holiday cottages. Turn left along the road. After passing the cottages, either turn right along a track, or continue to the beach. We went down to the beach and turned right. 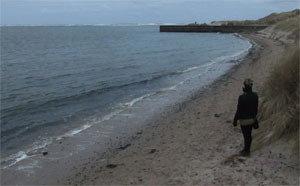 We rounded Budle Point, then had to climb up the dunes as it was close to high tide. On joining the track at the edge of the golf course we turned left. The track continues between the dunes and the golf course until blue markers show the right of way across the course. Walk towards the clubhouse and follow the access road for a short distance. Just beyond the Blackrocks lighthouse, leave the road to walk along Harkness Rocks and then follow the beach. Continue walking along the beach. There is a stream to cross (which may mean you have to walk up to the car park, then back on the other side). 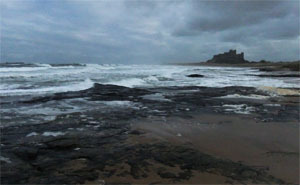 Walk below the castle and continue walking by the dunes until just before reaching an outcrop of rocks (Islestone). Look for a wide gap in the dunes and turn into it. 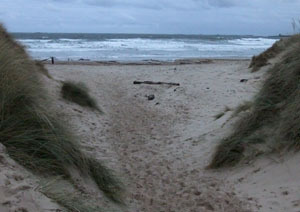 The photograph shows the view back to the beach from the path through the dunes. There are a network of routes through the dunes (which probably change) - continue to head away from the beach making for one of the gates which lead to the road. Turn right onto the pavement and walk through the village. Bear right at the green, staying on the B1342. About 1 mile after passing the village green, just beyond the crest of a hill, climb over stile on left and follow filed path. When the path meets a minor road, turn left, then almost immediately take footpath on right. This returns you to the car park at Budle Bay.